This is the first ever guest post which appears on my Blog, another first for me! Aggie approached me about this and offered a post which included some recipes for kids. Always on the lookout for something new to cook with the Boy, and fitting in with my love of Food I thought it would be a good match. I hope you like it. I love you, I really do, more than anything in the World, you make me so happy to be your Mum. But I must admit that I really would appreciate if you could stay in bed and be quiet (you don’t even have to sleep) between the hours of 11pm and 7am. A 9/10pm wake up is not ideal as you are probably interrupting catch up Casualty or Glee but its a good excuse for a sleepy cuddle so I won’t complain about those. After I have gone to bed and finally exhausted myself into a deep sleep, no matter how much I love you, I honestly would prefer to wait until morning to see you again. I don’t understand why the door open at 45 degrees does not constitute “door open a little bit” and needs to be adjusted a millimetre or two at 3am. I don’t believe you put enough effort into finding your “Toy Story water” in your bed at 4am when I have no trouble scrabbling in the dark for it. I wish your memory would be a bit better and recall that I killed all the monsters with monster spray when I put you to bed so there is no way they are still lurking in the shadows. Its not a lot to ask is it sweetheart? I got up with you in the night for 7 months to feed you (a valid reason to wake) and since then every time you have been unwell I have jumped out of bed to calm your tears or soothe your aches because it hurts me to see you in pain. However, I hope you will agree that monsters / water bottle / door open just don’t seem like good enough reasons to deprive me of sleep. I am currently making a little brother or sister for you (you honestly will appreciate it one day) and I accept that there will be more sleepless nights when it arrives but until then please can you help me out a bit? 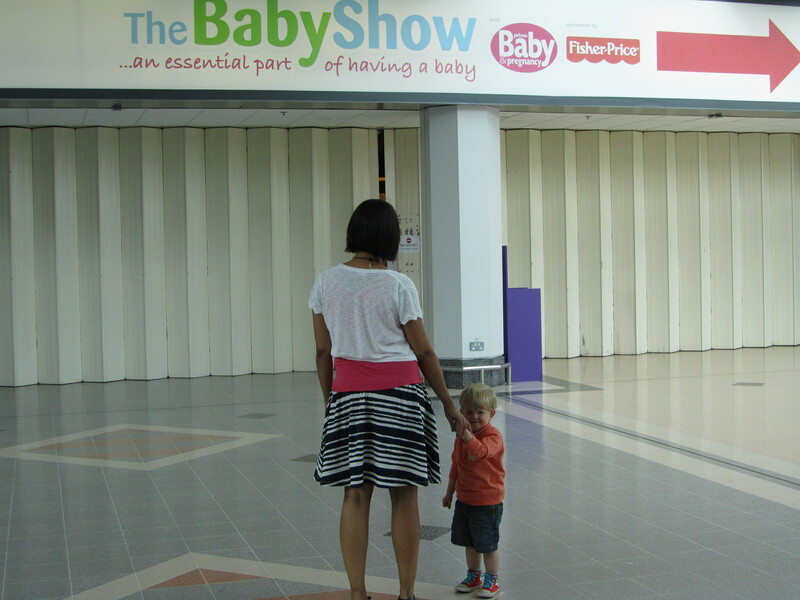 So I finally made it to a Baby Show on Friday, despite having tickets for shows for the last two years thanks to the Boy and his various chest infections (a long story), we missed out. In hindsight maybe fate was telling me to hold on until I was actually pregnant (I am, did I tell you already?) so I could justifiably spend money on cute things. It was a mammoth journey from leafy Surrey via two trains, one tube, various escalators and a 3 mile hike from the train station to the exhibition hall at the NEC in Birmingham. I met my hired hand for the day at the station (my sister) and off we went to explore the delights on offer. My main goal for the day was to check out the Stokke Xplory, the pram I wanted to get for the Boy but didn’t as it is very expensive and now every time I see a cute little baby sitting up high having a nice chat with Mummy or Daddy in one I am overcome with envy and regret. So as soon as I found out I was pregnant I told Hubby that this was what I was going to get and the sensible streak in him knows when not to argue with a hormonal pregnant woman. 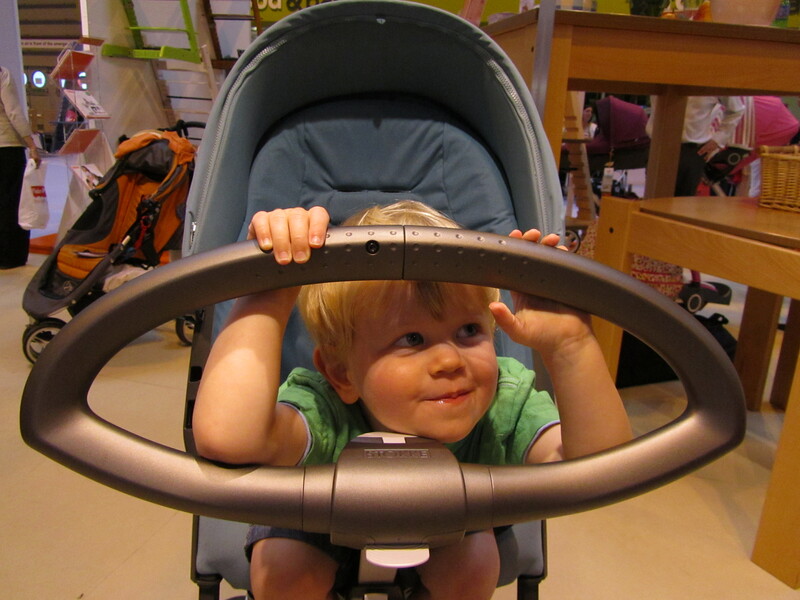 The Boy was my wonderful guinea pig for the Xplory and really loved it and although it is a mammoth item which will dominate our small dining room and boot space, I think most pram systems do this and so overall it’s worth it. The Boy had a lovely time in the Fisher Price crèche – usually I don’t put him in crèches as on my day off I like to make the most of my time with him but he wanted to go in and I wanted to shop so it was a win win situation. There was a Twitter / Facebook meet up in the afternoon and it was really nice to put faces to names of @petitmew, @mummymatters, @cafebebe, @mammamcann, @theBabyShow and to meet a new Tweeter @geekmummy. So I am pregnant again (15 weeks tomorrow!) and I am very excited at the prospect of going shopping again and it got me thinking about the best buys (or presents) we had for the Boy. There are so many products out there and so many different brands that its a minefield for any soon to be parents and even second/third timers who have forgotten, much like the agonising pain of labour and sleep deprivation which would cause us all to stop with one. This Swaddle calmed the Boy right down (after we fought him to get it on) and helped him sleep much better. It worked until about 12 weeks old when he could fight his way out. In hindsight I will probably buy one with a zip next time as it means they can’t escape so easily! Calms and soothes baby. Mamas and Papas bath was a fantastic baby bath which enabled me to bath the Boy on my own when the Man wasn’t there and still have my hands free to wash him / play row row with him rather than holding him so he didn’t slip under the water. Perfect if you are bathing a baby alone. You may have read this post about me wanting to save the environment but in the early days I could barely get myself dressed and fed so putting nappies in the equation would have been a nightmare. Instead we used a great local Nappy Laundry Service which would drop off 40 nappies a week and pick up the dirty ones. We paid £8 a week in 2008 so slightly more than the same amount of disposables but still a reasonable price. For an easier introduction to reusable nappies. Nursing chairs can be expensive but for me it was worth every penny to have a really comfy place to breastfeed / bottle feed the Boy, especially after still suffering with a bad back from pregnancy. At 3am the last thing you want is somewhere uncomfortable. We got a second hand Cosatto one which cost £300 new including a footstall for £120! Check out eBay or Gumtree for really good second hand ones. This Baby Gym was given to us by a friend but it was worth its weight in gold. The Boy would happily spend hours under it (from about 3 weeks old) until he was about 6 months old and a bit more active. Gives you some time with two hands to yourself! We bought this Baby Bjorn bouncer after reading great reviews on it, I think it must be the most expensive bouncer out there but we managed another bargain eBay purchase for it. Its great for carrying around the house to different rooms (much easier than the gym) so the Boy would sit in it if I needed to cook or when I was in the bath. A really good portable entertainment device. The Morrck Baby Hoodie is very very clever, rather than wrestling your baby into a snowsuit or struggling to get them out of it when they are asleep and you come indoors this wraps around them to create a lovely warm environment but can be easily unwrapped without disturbing them. Don’t bother buying a snowsuit, get one of these.